Just the other day we were talking about some potential uses of AMD’s new AM4 motherboards for Ryzen to build multi-GPU mining rigs and Biostar apparently has already have a dedicated solution available. 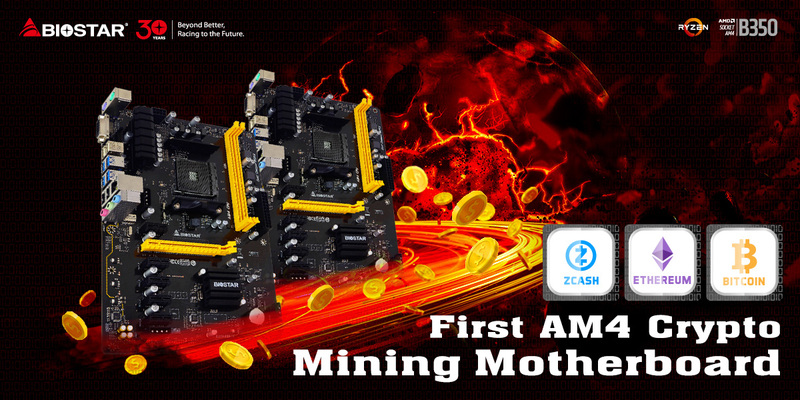 The motherboard manufacturer is trying lately to get more seriously into the crypto mining business and gain larger market share by utilizing the recent lack of AsRock Pro BTC motherboards and other suitable for 6x GPU mining motherboards. Biostar is not new to the GPU mining scene with their TB85 motherboard supposed to rival the very popular AsRock H81 Pro BTC and the more recent release in the form of Biostar TB250-BTC motherboard, both of which were for Intel-based platforms. 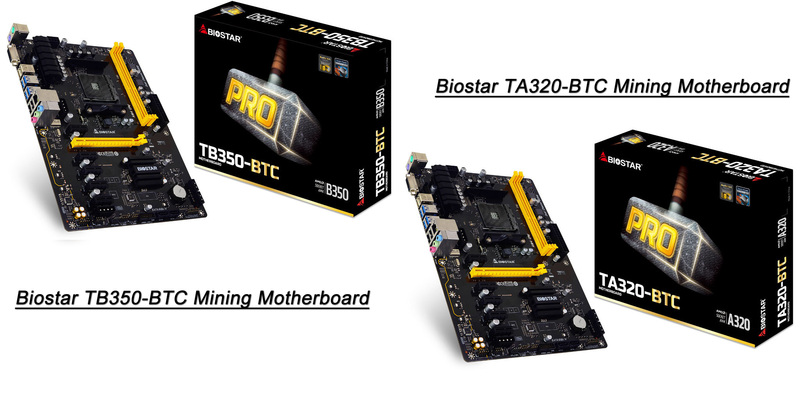 The two new BTC motherboards from Biostar meant for use with AMD’s AM4 platforms are the Biostar TA320-BTC with AMD A320 chipset and the very similar model with B350 chipset – Biostar TB350-BTC. Both motherboards feature 6x PCI-Express slots (single x16 and five x1 PCI-E) needed for building a six GPU mining rig for crypto currencies and go with the bare minimum of extra features that are not needed by miners anyway with the idea to make the price more attractive. There are two external 4-pin Molex power connectors on the motherboards available, though you don’t really need them if you are using powered extenders for the video cards anyway. Both new AMD AM4 motherboards (TA320-BTC / TB350-BTC) fully support all of the already announced and released AMD Ryzen 5 and Ryzen 7 CPUs and should support all upcoming lower-end AM4 models that we are expecting to see announced later thus year. The problem as we have already mentioned is in the fact that even the most affordable model at the moment, namely the AMD Ryzen 5 1400 is still a bit more powerful and expensive than what crypto miners are used to go for their GPU mining rigs with Intel processors. These two new motherboards will become much more interesting for miners when AMD introduces even more affordable Ryzen CPUs and especially APUs (with built-in graphics) than can make the cost of such a mining rig much more acceptable when compared to the Intel-based alternatives. We are waiting to see what the pricing of these motherboards will be when they hit the market, though considering their specific target and lack of extra features to make them attractive for crypto miners they should be pretty interesting price wise. Again the problem is with the price of the currently available Ryzen CPUs that at this point do not make these motherboards like they could become if combined with a more affordable AM4 CPU that can become available soon (hopefully). The other problem is the availability of Biostar products, again we are reminding you that the brand is not as widely available and popular like AsRock for example… it is not even available on many markets around the world. So even with Biostar already offering multiple Intel-based mining motherboards and these two new ones for AMD AM4 are also coming it is not possible for many miners to get their hands on these products.